In this article, I will show you how to configure sudo, set root password, disable root login and reset root password. This can be done even if you don’t have sudo enabled and you don’t remember the password. Let’s get started. If you have set up a root password while installing Debian 9 Stretch on your machine, then there’s a chance sudo won’t be configured. So you won’t be able to run any commands as root user if you’re logged in as an ordinary user. In this section, I am going to show you how to install and configure sudo to run commands as root user without login in as user root. Now type in your root password and press <Enter>. You should be logged in as root user. It should be installed. In my case it is already installed. NOTE: Here shovon is an ordinary user account on my Debian 9 Stretch system. Enter the login password of user shovon and press <Enter>. 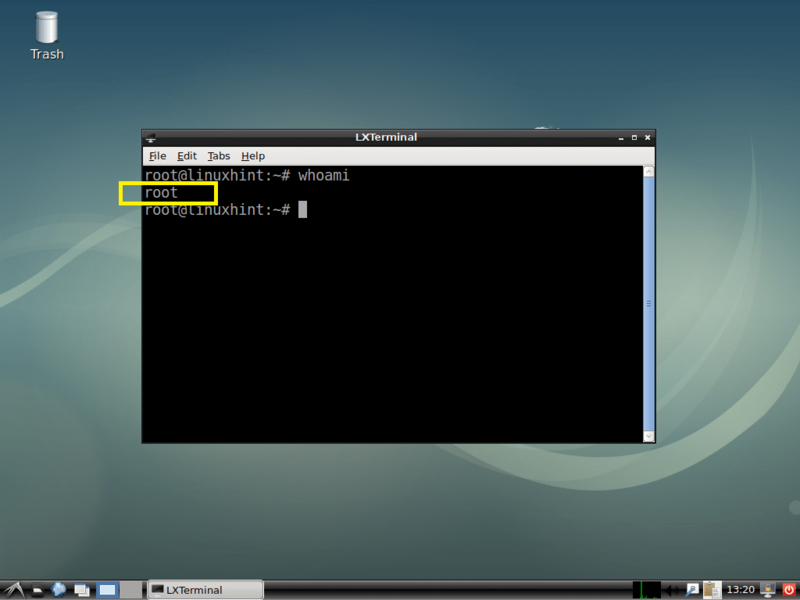 The command should run as root as you can see from the screenshot below. If you haven’t set a root password while installing Debian 9 Stretch, then root password by default won’t be set. But sudo should be configured for your ordinary user. Now type in the password for your logged in user and press <Enter> to continue. Now type in your desired root password and press <Enter>. Now retype the root password and press <Enter>. The root password should be set. Now you can login as root using your root password. Now do the same things as you did on the Setting Root Password section of this article. To allow root login again, just set a root password again. 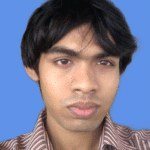 For more information, take a look at the Setting Root Password section of this article. If you happen to forget the root password and you don’t have sudo configured, then don’t give up just yet and think about reinstalling the operating system again. There is a way to reset the root password. First reboot your computer. You should see the GRUB menu when your computer boots as shown in the screenshot below. 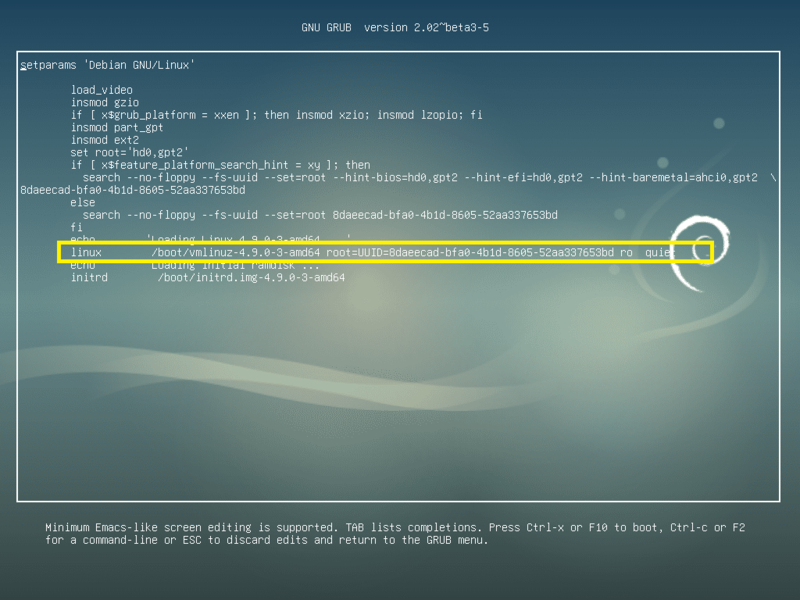 Select Debian GNU/Linux and press e.
You should see the following window. Now go to the end of the line as marked in the screenshot below. Now remove ‘ro quiet’ part from the end of the line and append ‘init=/bin/bash’ to the end of the line as marked in the screenshot below. Once you’re done, press F10. Now type in your new root password and press <Enter> to continue. Now re-type your new root password and press <Enter> to continue. You root password should be changed. Now press <Ctrl> + <Alt> + <Delete> and your Debian 9 Stretch machine should reboot. Now you can login as root with your new root password as you can see in the screenshot below. This is how you reset your root password on Debian 9 Stretch. Thanks for reading this article.